Yongxi Ou presents invited talk on “Fast, efficient and reliable spin-orbit switching of W-based three terminal magnetic tunnels,” at: The 3rd (ImPACT) International Symposium on Spintronic Memory, Circuit and Storage, Sendai Japan, Sept. 23-25, 2017. Congratulations to Graham and everyone, on publication of our paper “Nanosecond magnetization dynamics during spin Hall switching of in-plane magnetic tunnel junctions,” G.E. Rowlands, S..V. Aradhya, S. Shi, E. H. Yandel, J. Oh, D. C. Ralph, R. A. Buhrman, Applied Physics Letters 110 (12), 122402 (2017). 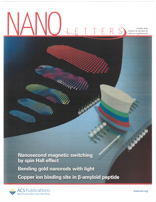 Congratulations to Sriharsha and everyone on our cover article in NanoLetters: “Nanosecond-Timescale Low Energy Switching of In-Plane Magnetic Tunnel Junctions through Dynamic Oersted-Field-Assisted Spin Hall Effect,” S. V. Aradhya, G. E. Rowlands, J. Oh, D. C. Ralph, and R. A. Buhrman, Nano Letters 16, 5987 (2016).